It's an innocuous turnoff from Highway 178 on the way to Death Valley. he Trona Pinnacles are an unusual geological feature in the California Desert National Conservation Area. 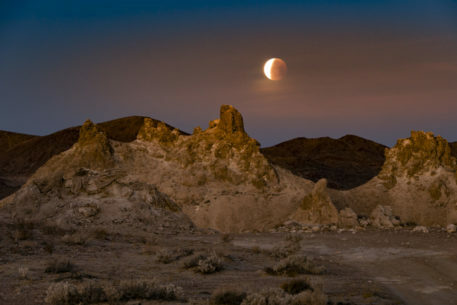 The unusual landscape consists of more than The Trona Pinnacles consist of 500 tufa spires (porous rock formed as a deposit when springs interact with other bodies of water), some as high as 140ft, rising from the bed of the Searles Lake (dry) basin. The pinnacles vary in size and shape from short and squat to tall and thin, and are composed primarily of calcium carbonate . They now sit isolated and slowly crumbling away near the south end of Searles Valley, surrounded by many square miles of flat, dried mud and with stark mountain ranges at either side. The Pinnacles are recognizable in more than a dozen hit movies. Over thirty film projects a year are shot among the tufa pinnacles, including backdrops for car commercials and sci-fi movies and television series such as Battlestar Galactica, Star Trek V: The Final Frontier, Disney's Dinosaur, The Gate II, Lost in Space, and Planet of the Apes.